!! L.A. cops sweep the homeless off the streets !! Despite a federal court opinion that criminalization of sleeping on the sidewalk constitutes “cruel and unusual punishment,” the LAPD is moving forward with plans to clean up Los Angeles’s infamous 50-block Skid Row neighborhood by arresting homeless people on a variety of small charges, from sitting on the sidewalk to possessing stolen milk crates. 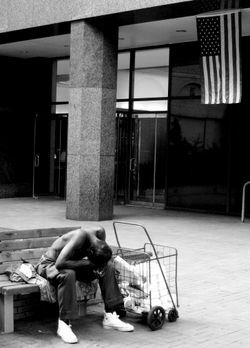 Despite the claim by the police that they are helping the homeless find their way to shelters, one big problem remains: there are an estimated 80,000 homeless people in the L.A. metropolitan area and only 18,000 beds. But it’s not all bad; Skid Row also now has some adorable new wine bars and art galleries, along with a yoga studio you can walk to from your new luxury loft-style condo. 1 Comment on "L.A. cops sweep the homeless off the streets"